Fleas and ticks can transmit serious diseases to both man and animals. Bubonic plague or “black death” killed millions of people in the middle of the 14th century and is transmitted by the bite of the oriental rat flea. It is still present today. However, effective control of the Norway rat – which is a primary host of the oriental rat flea – limits the incidence and spread of this disease. Fleas and ticks all feed on the blood of animals. Females of both ticks and fleas must have a blood meal before they can produce viable eggs. 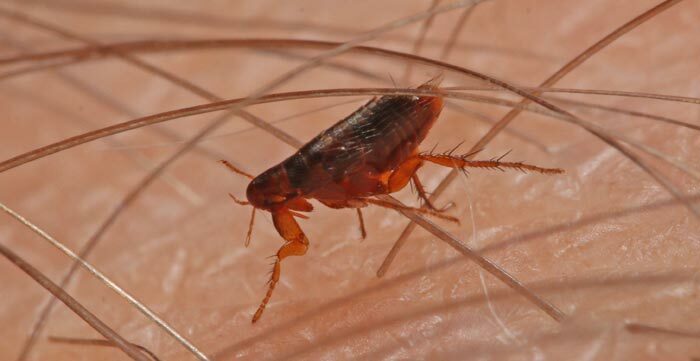 Effective pest management efforts for fleas and ticks includes the treatment of pets, buildings where pets live and the outdoor areas that pets frequent. Cat Flea – Ctenocephalides felis (Bouche). The cat flea is the most common flea on domestic dogs and cats as well as most wildlife found in urban areas. Fleas can transmit tapeworms to animals. The adult fleas are almost always found on animals, as their only food source is the blood of the animal. They are flattened from side to side when viewed from above and this shape enables them to move through the hair of the animal very quickly. The other stage of development (eggs, larvae and pupae), occur off the animal. Some people are more sensitive to flea bites than others. Some animals are also this way. Fleas can build up large numbers in some areas causing extreme discomfort to people and pets. A thorough treatment of all the places where animals frequent needs to be done to ensure adequate control. Inside and outside treatments may be necessary. Brown Dog Tick – Rhipicephalus sanguineus (Latreille). The brown dog tick is one of the most common ticks encountered on animals of all types both domesticated and undomesticated. When the tick takes a blood meal from an animal and is full, it typically drops off the animal and can be found in areas frequented by the animal such as inside structures. They are flat, uniformly red in color and have pits scattered over the entire surface of the back. Males do not become enlarged when feeding as do the females. American Dog Tick – Dermacentor variabilis (Say). As the name implies, this tick is commonly found on dogs. However, they can be found on many other large animals. Adults are generally brown but become slate gray when engorged on blood from the animal. It is a vector of Rocky Mountain spotted fever and is commonly associated with tick paralysis. It is widely distributed throughout the United States. Relapsing Fever Tick – Ornithodorus turicata (Duges). 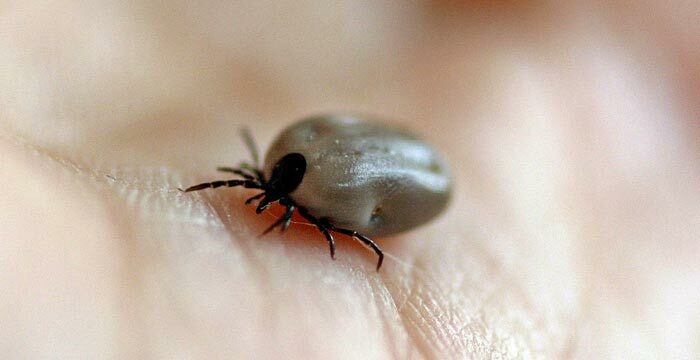 One of the “soft” ticks, this tick can transmit the causal organisms of relapsing fever in humans, hence the name. They usually feed on small animals such as squirrels, mice, chipmunks or rabbits. Soft ticks usually feed at night, feeding from 15 – 30 minutes and then letting go of the host. Symptoms of tick-borne relapsing fever usually develop within 7 days after being bitten. Deer Tick – Ixodes scapularis. It’s also known as a blacklegged tick and in some parts of the USA as the bear tick. It is a hard-bodied tick (family Ixodidae) of the eastern and northern Midwestern United States. It is a vector for several diseases of animals, including humans (Lyme disease, babesiosis, anaplasmosis, etc.) and is known as the deer tick owing to its habit of parasitizing the white-tailed deer.